Oh, that Mike Scott, he’s just full of surprises, isn’t he? You buy an album expecting it to be full of stadium rock songs and it’s stuffed with mandolins and folk songs. You buy an album expecting it to be full of mandolins and folk songs and its loaded with hard rock tunes. Sheesh, just give us a break. But that’s what makes him such a vital artist; he’s always changing, and as such, he’s impossible to second guess. And that’s a good thing. That said, if you’re a long time Waterboys fan, you’d better brace yourself, as for Out of All This Blue, Scott has driven the bus down the most bizarre back road of his career. Celtic-Hip-Hop-Indie-Dance anyone? Hello? Who remembers the end of last century when rock and pop artists fired their drummers and grabbed a load of loops and samples? Results were “mixed” to say the least. Well, for the 12th Waterboys album, that’s exactly what Scott has done. And guess what, the results are “mixed” to say the least. Previously, Scott has managed to sidestep being tied to a particular era, but on this album, he’s squarely in the late '80s/early '90s, and it’s not a great fit. All it needed was for one of the songs to have an ill-advised rap in the middle to hammer in that last nail. Out of All This Blue is a double album. And if that isn’t enough, there’s a whole bunch of bonus tracks, and alternate versions tacked on, too. Thirty-four songs all together. If you’re having a “Sandinista!” flashback, you’re about right. Scott is an incredibly prolific artist and has a canon of songs which must be in the high hundreds by now, but previously, he would pare his creativity down to a handful of great songs per album. On this one, he’s removed that barrier, and we get a huge splurge of stuff -- rather than polishing 12 tracks to a high sheen, he’s given us 34 tracks, some of which sound like studio jams and demos. And not in a good way. “Hiphopstrumental 4 (Scatman)”, “Girl in a Kayak” and “Skyclad Lady” are bits of inconsequential fluff, and “Rokudenashiko” collapses under the weight of its string section. Scott has apparently fired his quality control manager along with his drummer. There are some lovely moments: “Girl in the Window Chair” has a charming Serge Gainsbourg feel, while “Didn’t We Walk on Water” could almost be a Barry White production. But just when you feel as if the album could turn towards the sun, along comes “Yamaben”, a throwaway song, written about his wife’s lawyer. Really. The only saving grace of Out of All This Blue is Scott’s storytelling. The lyrics are generally excellent -- funny, poetic, visual and expressive. That’s when he isn’t writing about his wife’s lawyer, that is… These words deserve better than the music that has been made to accompany them. “The Hammerhead Bar” is similar in feel to “The Return of Jimi Hendrix” from Dream Harder, but this time Scott tells us about a twisted evening in John Entwistle’s bar and Scott’s lyrics sparkle and shine, and you’re almost there with him. It’s a high point in a generally lacklustre release. 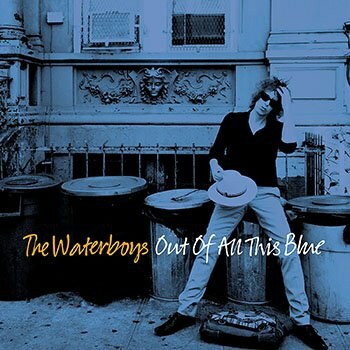 What will the next Waterboys album sound like? Polka? Barbershop? Death Metal? Who knows? At this point, not even Mike Scott could tell you. The idea of him working with hip-hop production techniques is really interesting and there still could be a brilliant Waterboys album using this approach. Unfortunately Out of All This Blue isn’t it.